ASW MedChem is proud of its record in synthesizing quality compounds at rapid speed. We are skilled at tackling complex synthetic routes with ease and on scales ranging from milligrams to kilograms. 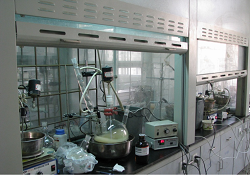 ASW Medchem has conducted a broad range of chemistry projects ranging from design and synthesis of biologically relevant heterocyclic systems through asymmetric synthesis, peptide chemistry, nucleoside chemistry and total synthesis of natural products. With an established reputation as one of the most reliable and high quality chemistry service providers in the world, ASW Medchem has the scientific expertise to support a vast range of discovery projects. Our years of experience in working with the world’s biggest pharmaceutical companies and most progressive biotech startups assist us in enhancing our partners’ discovery campaigns. With state-of-the art facilities and a team of dedicated scientists we are ready to support your efforts in these areas.